In Windows 10, Microsoft has made changes to Windows Update. 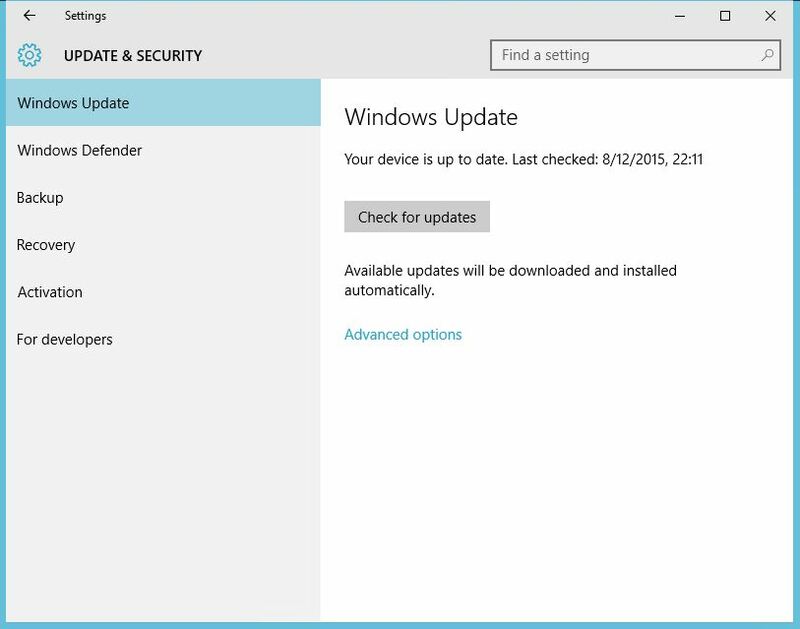 These changes primarily affect how to access Windows Update and how updates are installed. In this article, those changes will be discussed along with looking at the options that can be used by Windows Update. Users also can choose to install preview builds of Windows using Windows Update. The process to start installing those updates also will be looked at as part of this article. In Windows 10, users will need to open the Settings window before they can access Windows Update. 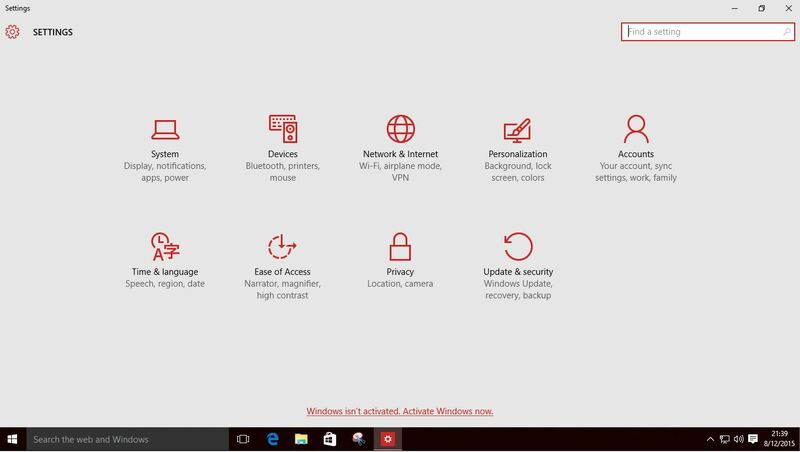 In the Settings window there are nine categories that are used for making changes to different aspects of Windows 10. For this article the only category used will be the last one listed, Update & Security. To get to the Settings window, users have two choices. The first option is to open the Start menu and click on Settings or users have the option of opening the new Notification Center and then clicking on the All Settings option. From the Settings menu, click on the Update & Security Category to open it. With Windows 10, users can no longer go to the Control Panel and install updates as that functionality has been removed. Users can still look at the installed updates by going to Programs and Features and clicking on the option to View installed updates but that is the only part of the old Windows Update functionality that remains. Once Update & Security is opened to the Windows Update section, Windows 10 will automatically look for and install updates. If there are any updates to install they will be listed in the Windows Update frame on the right side of the Update & Security window. If the computer is up to date, there will be a message stating that the computer is up to date. 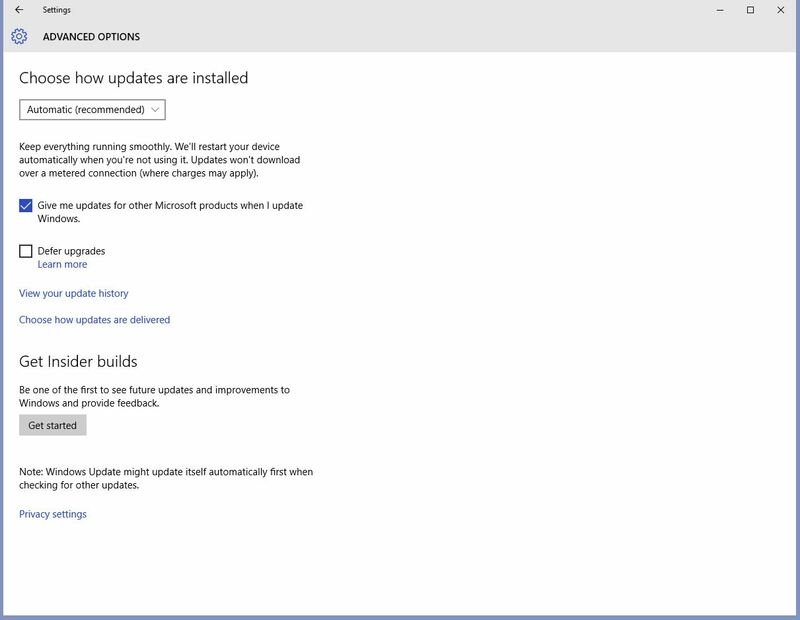 Like previous versions of Windows, users can choose to check for updates using the Check for updates button. If there are updates to install, they are now installed automatically. Like previous Windows versions, some updates require the computer to be restarted. With Windows 10 Microsoft made a change regarding the restart process to add automatic restarting of the PC. Although Microsoft added this functionality the computer will not restart immediately after the updates are installed. Instead the restart will occur at a time the computer is normally not being used. In the image below, there are three restart options that users can choose from. The first option lets Windows restart the computer at a time when it is normally not in use. This option also includes the estimated time when the restart will occur. The second option allows users to set a specific time to perform the restart. The third option is to restart the computer now. There is also a link to open the Advanced options in the Windows Update frame. The link for Advanced options will be the last item listed. Clicking this opens a new window allowing users to make changes to how Windows Update functions. At the top of the Advanced Options window users can choose how updates are installed. The first part of this section allows uses to select how computer restarts are performed after Windows installs updates. There are two options; Automatic, which is the recommended option, and Notify to schedule restart. 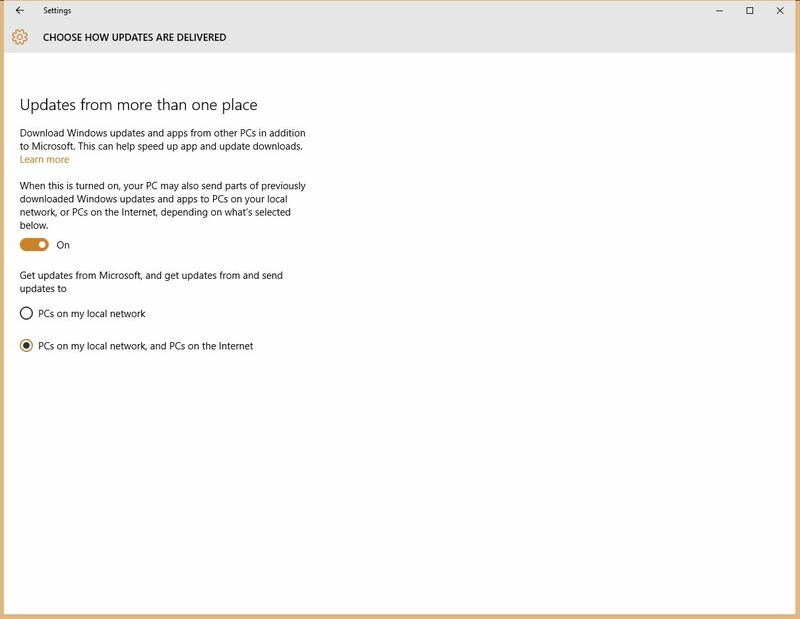 For both of these options, Microsoft states in the description of the option that updates will not be downloaded over metered connections (where charges may apply). When the Automatic option is selected the computer will install updates and then restart automatically at a time when the computer is not in use. 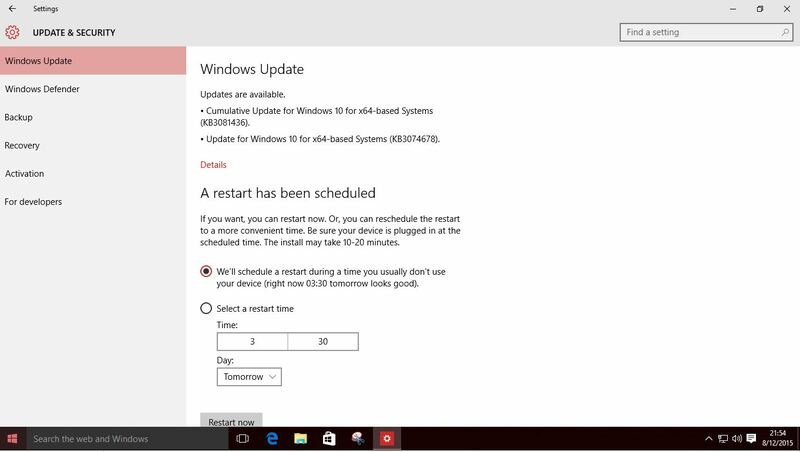 The Notify to schedule restart option is used when users want to select their own time for restarting the computer after updates have been installed. Microsoft has two additional options that are part of this section. The first checkbox option is to install updates for other Microsoft products when Windows is updated. An example of other updates that may be installed would be updates for Microsoft Office products. The other checkbox option in this section is to Defer upgrades. When this option is selected, users will only get security updates for Windows. Other updates such as those introducing new features will not be installed for several months after they are released. Below the two checkbox options are two links. The first link allows users to look at the updates that have been installed. After clicking on the link to View your update history, a new window will load allowing users to view the installed updates. Users can also uninstall updates, uninstall preview builds if they are using those, and to look at information about the installed updates. Clicking on the Uninstall updates link loads another window that shows users the updates. To uninstall a Windows update, right-click on the update and select uninstall. Clicking the Uninstall latest preview build link loads the Recovery section from Update& Security. The second link in the Advanced options window shown above allows users to make changes to how updates are delivered. Clicking on the link opens a new window with additional information about how users can receive updates from more than one place. Microsoft has added the capability to download parts of the updates from other PCs. Users can disable this new feature by turning off the option on this screen. If users wish to receive updates from more than one place, they also have the option to select whether the updates are just shared between computers on the local network or if the updates will be shared between computers on the local network and with computers on the Internet. The default settings in this window are to get and share updates from more than one location and to share the updates to computers on the local network and the Internet. For users who have bandwidth limitations or who are uncomfortable with sharing the Windows updates over the Internet to other unknown computers, you can turn off the option if you only have one PC on your network or select to share the updates with PCs on my local network. After choosing how updates are installed in the Advanced Options window users also can choose whether they wish to be part of Microsoft’s Insider program. This program allows users to preview new builds before they have been officially approved for release to all Windows 10 users. Insider builds are preview builds that may include new features or fixes to existing issues but the insider builds may introduce other bugs that need to be fixed. As such, Microsoft provides the following warning messages that users will see prior to joining the Insider program. Users also will need to confirm that they wish to receive Insider builds. 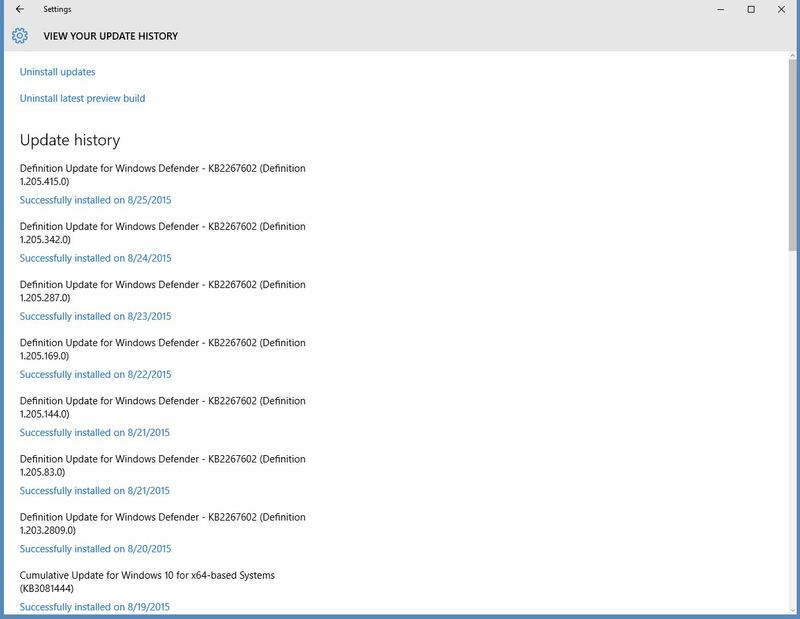 Most users likely will not need to use this functionality but it is part of Windows Update. Users that are part of this program will receive the preview builds using the Windows Update functionality. The last item shown in the Advanced Options window is a link to the Privacy settings. These settings are not part of the Windows Update functionality so they are not being addressed in this article. There will be future articles that will cover the privacy settings and other Windows 10 features. With Windows 10, Microsoft changed the update process used in previous versions of Windows. 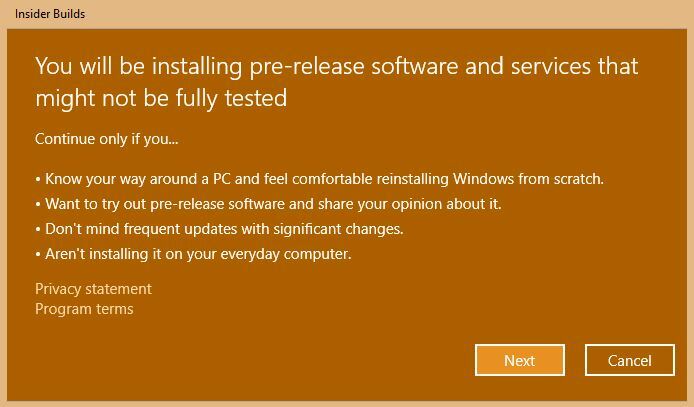 These changes included the changes both in how to access Windows Updates and in how updates are installed. Microsoft also added the ability for users to choose to get Insider (preview) builds of Windows. Users may also install updates for other Microsoft products or defer installing upgrades if necessary. These options do allow flexibility to users to choose how they wish to handle installing updates on their computers. If anyone has any comments or questions, feel free to post in the comments section below or email me at the link in my bio.